Public law enforcement coverage is being spread thinner and thinner. Texas communities have become aware and alarmed by the situation. With greater frequency Statewide Patrol is being asked to fill some of the voids left by the depleting ranks of Law Enforcement. Many security concerns, especially crime prevention and maintaining order, are common to both private and public law enforcement. In theory the goal of Law Enforcement agencies is to prevent and reduce crime, in practice most of their resources are depleted in response to rather than the prevention of crime. Statewide Patrol on the other hand is primarily concerned with maintaining order, apprehending criminals and enforcing laws within a constitutionally and statutorily mandated criminal justice system. 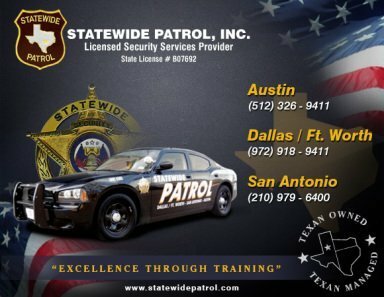 Statewide Patrol’s standing guards project authority, professionalism, and confidence. The look of our uniform closely resembles those of law enforcement; including a metal badge, brass nametag, shoulder patches, and appropriate rank. Our Services are Digitally Verified! 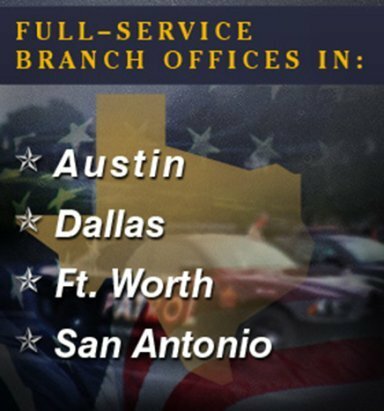 Our Officers are MEB® Baton Certified! Our Officers are Handcuffing Certified! Our Officers are Radio Equipped! Our Supervisors are On-Duty 365 days/year! Our Managers & Supervisors are available by phone 24/7/365! Our Dodge Chargers offer the most professional & polished look in the Patrol Industry today!